Early man used to sit back and wonder at the eagles soaring so effortlessly high above them. Over the years many tried to emulate them. They made frames and covered them and attempted to float off high hills and achieved spectacular results. However other than cleansing the gene pool results were poor. On June 4, 1783 the Montgolfier brothers stepped into the fray with a sackcloth balloon lined with paper. 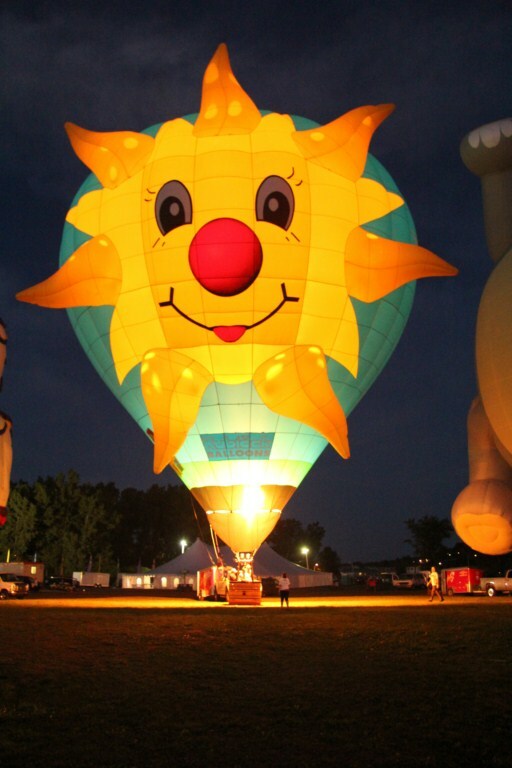 On this date they filled their balloon with hot air from a pile of burning straw and it rose to the sky and remained there several minutes. As with the development of space craft, they experimented by sending up a sheep, and other farm animals and birds. This was followed by humans in tethered flights and then later two humans took off near Paris in a truly untethered hot air balloon flight. 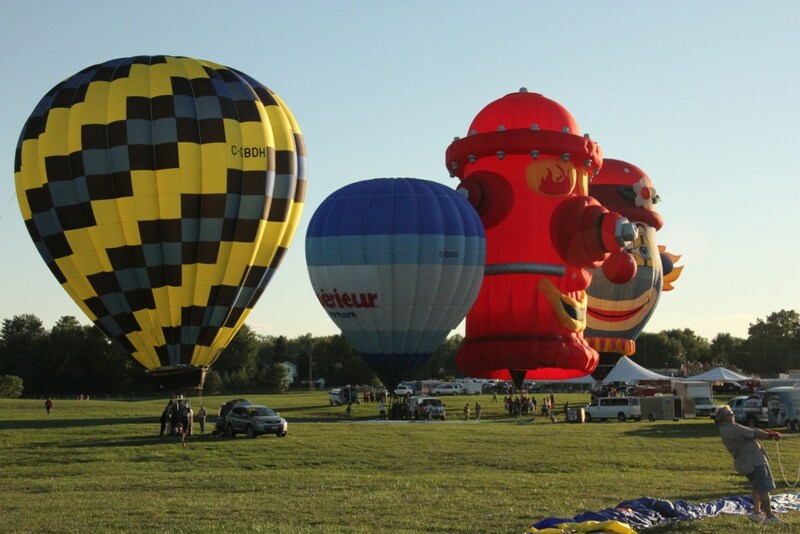 In the fall of 2012 the Gatineau Hot Air Balloon Festival celebrated 25 successful years of the show. As part of the celebration there was a recreation of the original balloon flight and many people took on costumes of that period and launched the balloon using the heat of a simple fire. 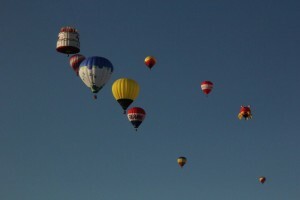 Of course the big attraction at the festival is the launching of a myriad of hot air balloons in many shapes and colours. Some of these were far from the traditional teardrop shaped balloon. There was a hydrant, a clown, an elephant riding nose down, a large butterfly, a crab, and a huge Happy Birthday cake balloon. 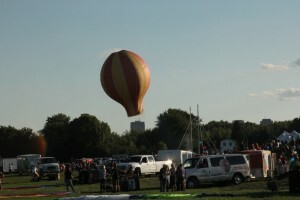 Balloon launches are weather dependent and not all days were good for getting them aloft. 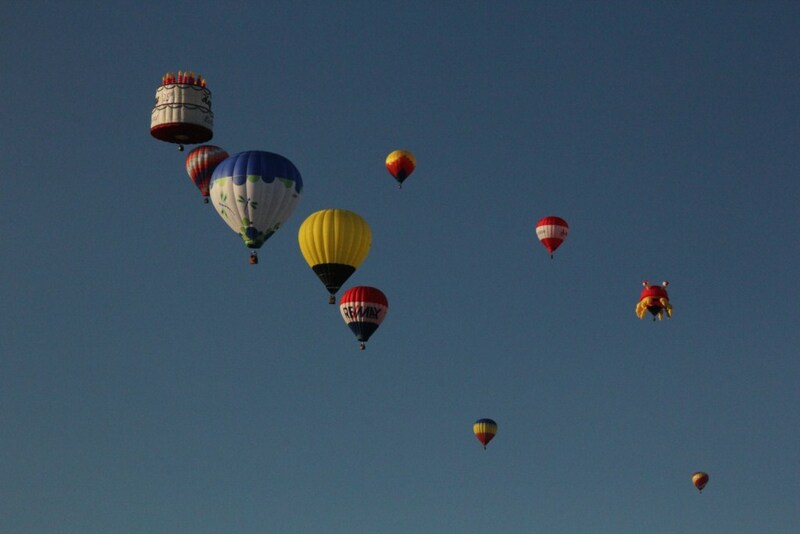 But when they went up, it was a spectacle of colour as one by one, and sometimes in bunches, the huge balloons floated up, up, and away. To aid them in their happy get-away the saxophone quartet, Sax Appeal, played a group of stirring melodies designed to stimulate the excitement of the launch. 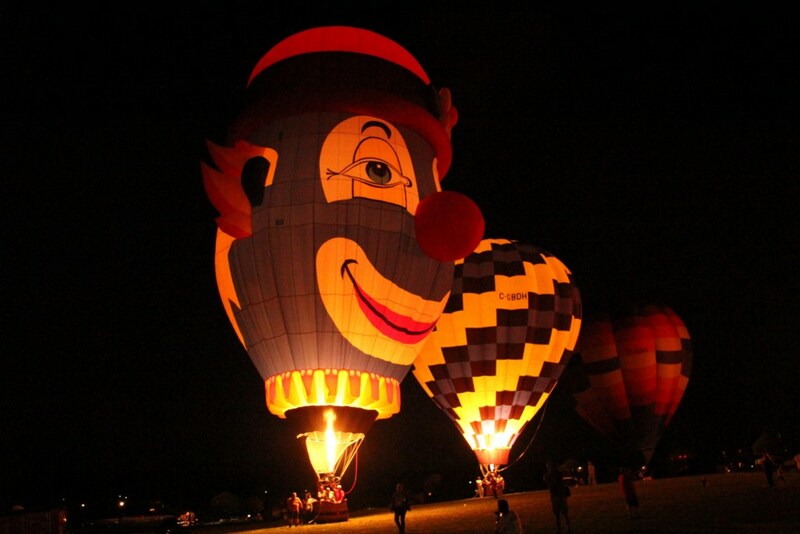 On two evenings the balloons were tethered while the flames from the propane burners lit their interiors so that the balloons glowed in a miracle of light and beautiful designs. This famous time of ‘night glow’ is looked forward to by everyone. 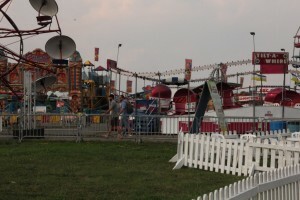 The midway carnival had the young people tied in knots as the various rides flung them every which way possible. If you measure the scream level, it sounded as if they were enjoying every scary moment. The adults amused themselves visiting the Arts and Crafts tents, and a variety of magic shows, acrobatic displays, and sampling the offerings at the Tim Horton’s pit stops and other hospitality tents. On Sunday night the Grand Stand show featured Isabelle Boulay whose excellent singing voice, and quality band was the hit of the festival. It was music designed to sound like music and not just a lot of noise, and it was a hit with the audience. This singer should take her skills across North America. While we were in the area we visited two great eating places, the Buffet of the Continents and the Restaurant Fondue and Raclette. These are two distinctly different experiences. The buffet had food representing many different countries. It was impossible to sample everything. It was all tasty, and the meats were kept hot to bring out the flavour. With all kinds of ice cream and dessert to finish off the meal it was impossible to go away unhappy. The Fondue and Raclette is a different eating experience. It’s designed as a slow meal where there is time for conversation. It developed from a time when everyone sat around the fire and pulled their food from a common cooking vat. Here the food is prepared at the table on little cooking tops and you take the food as it comes to you and cook it as you would like. The Festival has an open field campground for RVs and it was really packed with a steady stream arriving on Friday and Saturday. The staff there were very helpful. 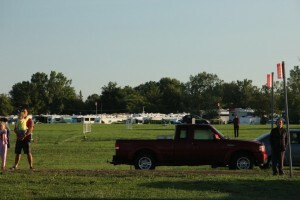 The Balloon Festival is held on the Labour Day weekend and I certainly would recommend it as a nice place to camp for a few days and enjoy the balloons, the midway, and the display tents.